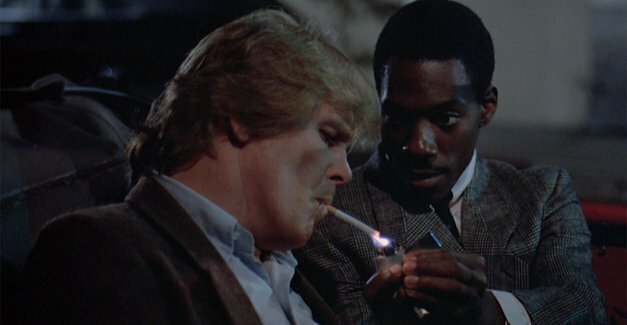 It may come as a surprise to the youth of America, but Eddie Murphy was not always synonymous with low-grade kiddie flicks, and Nick Nolte used to be more than just a first round pick in the office Celebrity Dead Pool. 1982 found Murphy making his film debut after a star-making run on SNL, and Nolte was considered solid enough to be the headliner of an action flick. I’ve never seen this thing all the way through, so when both it and the sequel showed up on HBOHD, I snagged them on the DVR. I watched 48 HRS. (1982) on 3.20.12. It was my first complete viewing of the film. For an action-comedy, this movie is surprisingly light on both. While there are certainly a few humorous moments, most of this is played remarkably straight. Director Walter Hill even sneaks in a deft three minute single-shot sequence in a police station. The shot has enough moving parts to feel inspired by Scorsese, and then nothing similar occurs through the rest of the film. I read on IMDB that much of the dialogue between Nolte and Murphy was improvised. This entire movie feels like a premise without a script. The characters wander around awhile, stumble into the bad guys, talk to some girls who are supposed to be important but sure feel like after thoughts, fight each other, and become friends. This isn’t to say that it is all bad. On the contrary, it has enough levity and the right tempo to never be boring. But… nothing… really… happens. The bad guys are weak. The women are weak. The dialogue is irrelevant, if sometimes funny. Yet, I don’t dislike this movie at all. Go figure. Much of that is thanks to the odd chemistry between Nolte and Murphy. This movie should feel racist, since there is plenty of racism in it. But the way these guys go after each other makes the entire thing feel somehow harmless. It defies logic. I do find it strange how much people yell in this movie. There is no nuance in the anger. The police chief literally yells every line, and not in a funny way. Much of the disconnect between Nolte and his girlfriend, Annette O’Toole, is born from the fact that she does nothing but yell at him over the phone for the entire movie. I just don’t have a grasp on this movie. Looking at the numbers below, I should hate it. But I don’t. I should have no interest in watching the sequel, but I’m curious to see if they cleaned up the problems and made a proper action-comedy (or even a post DIE HARD action movie with some humor). I’m not sure I ever need to see this again, but it was certainly not a waste of time. I just feel let down by 48 HRS., especially since it is considered a classic by so many people. ~ by johnlink00 on March 20, 2012.